The study of cosmic rays from outer space commenced at Mawson in 1955 with the completion of the first cosmic ray observatory and has been almost continuous since then, with the exception of a short break in 1978, when fire damaged the equipment. Originally two high zenith angle muon telescopes were used, each of which consisted of three trays of Geiger counters. The astrophysics experiments performed by these two muon telescopes were the first conducted on the continent and activated the birth of the Mawson cosmic ray program. These early telescopes demanded high maintenance and often experienced faults, one of which spoiled the measurements obtained of the great solar flare (23 February 1956). A 12IGY-counter neutron monitor was taken to Mawson in late 1956 and over the years has proved invaluable for recording numerous solar flares. This 12IGY-counter neutron monitor was upgraded to a 6 NM-64 neutron monitor in 1986. 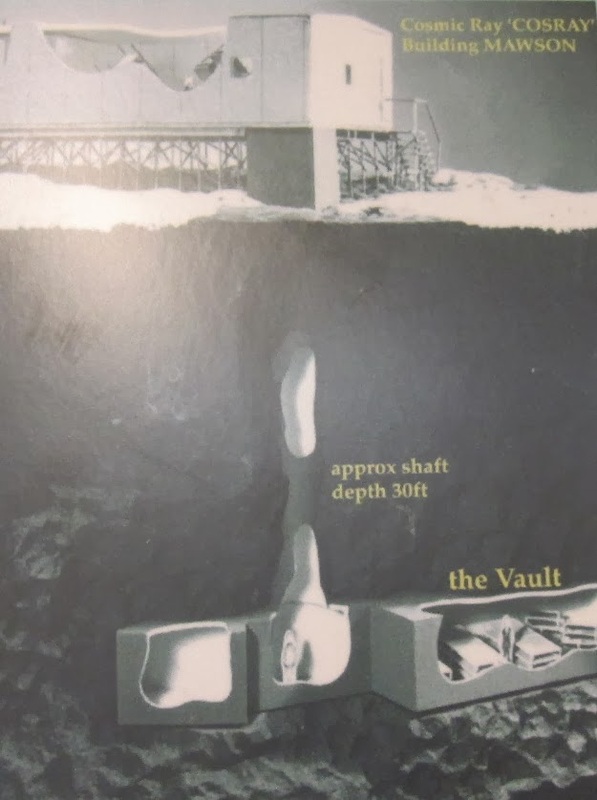 In 1971 construction of a new cosmic ray observatory was commenced which included blasting an 11 meter deep vertical shaft into the solid rock and blasting out a seismic vault and an underground observatory area lined with timber from a demolished riometer aerial, in order to reduce the amount of low energy particles reaching the detector. One underground chamber houses four muon Geiger counter telescopes while the other chamber was used for seismic observations. A third muon Geiger counter telescope was installed above ground adding to the two original muon telescopes and a 6IGY and a 12IGY-counter neutron monitors. These muon Geiger counter telescopes were used up until 1987 when they were replaced by larger area multi-zenith angle proportional counter systems. The monitoring and data acquisition of cosmic rays was automated at Mawson in 2009 and the observatory equipment is now managed by the Bureau of Meteorology, with additional assistance from station personal. Both the proportional counters and 6/12IGY-counter neutron monitors count the number of cosmic rays bombarding us from outer space – but the proportional counters are also able to provide an indication of where these particles come from. So what is a cosmic ray? Put simply, cosmic rays are “pieces of atoms” (mainly protons and atomic nuclei), flying through space at close to the speed of light. Because these particles have mass, as well as high speed – they can carry enormous levels of energy. Trying to harness that energy has so far been impossible. These high speed cosmic particles are charged, so they interact with the earth’s magnetic field. This changes their direction so that once they eventually reach the telescopes it’s often difficult to tell exactly where they originated. Current theory suggests that most cosmic rays are produced from supernovas (exploding stars) but there has been some conjecture on this. The amount of cosmic rays detected is reasonably constant all year round, though there are sometimes variations from year to year and over 2 million cosmic rays fly through our body's every day!! Impressive stuff Craig - and the vault looks clean and dry, no ice or water. Must be permanently cold down there? Where do the seismographs report to, and is Mawson on the receiving end of any significant seismic activity? The sump pump in the vault was frozen in ice, other than that it's dry as a bone down there. The Mawson seismic recorders report back to Geoscience Australia. I know they pickup a lot of tremors but I'm not aware of any significant activity in this area. Hey Craig, I was the Cosray engineer winter of 1987 and then again the summer of 1988-89. I installed the low energy particle telescope (the one in a white vinyl) as well as a new telemetry system for all telescopes (as far as I know it is still in operation). What years were you at Mawson? Craig, it's good to see all this hand built and designed from scratch stuff is still operational. Your faCTS are pretty close, a couple of the underground directional telescopes were in place when I arrived in 1987 as well as one of the standing muon telescopes above ground. I assembled the remainder of the above ground telescopes and calibrated during the winter of 1987. Then on return to Oz I worked with the University of Tas to build a new data management system which I installed FOR THE WHOLE STATION the following summer. That was when the data collection moved from "ticker tape" to the (then) new satellite system. Data was now automatically transmitted to Oz via the satellite (no more daily ticker tape output). Really glad they are still sending guys down to Cosray. No big surprise on the RTA of the Muon tubes. In reality they shouldn't be radioactive, but I doubt anyone will want to touch them, just too much paperwork. Thanks so much for your write up.